A deep cyclone develops over the north Atlantic, producing severe winds in the area between Iceland, the Faroe Islands and Scotland. A cutoff low over the central Mediterranean moves southeast, producing thunderstorms with limited organization. A cutoff low over N Morocco remains virtually stationary producing some thunderstorm activity. 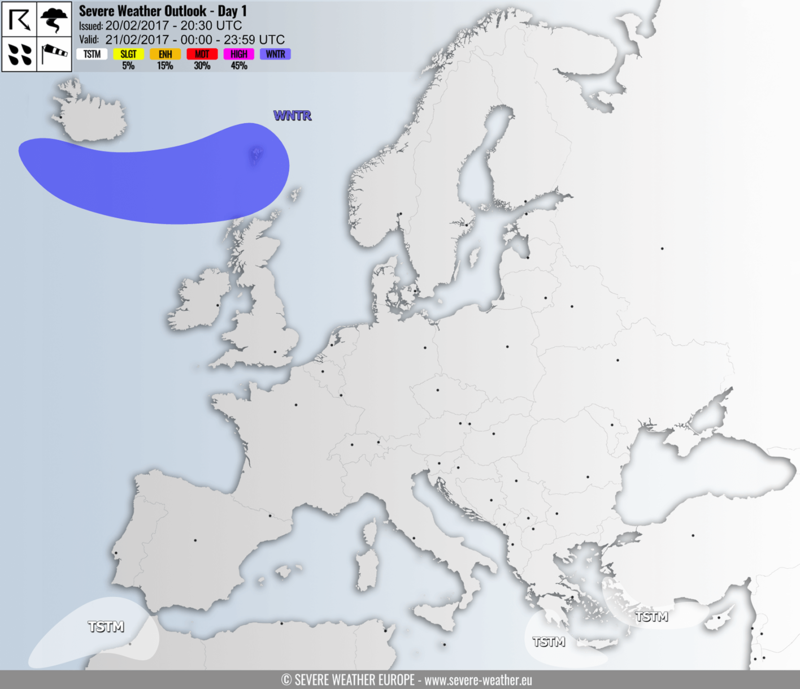 A WNTR risk has been issued for the north Atlantic between Iceland, Faroe Islands and Scotland for severe winds gusting at up to 110-130 km/h. A TSTM risk has been issued for central Mediterranean west of mainland Greece and Crete. Expect hail, strong winds and torrential rainfall, but likely below severe limit. A TSTM risk has been issued for east Mediterranean and the coast of SW Turkey for scattered thunderstorms. A TSTM risk has been issued for N Morocco and the Atlantic ocean off the coast of N Morocco for hail, strong winds and torrential rainfall, but likely below severe limit.